Point and shoot cameras are getting slimmer and smaller as technologies mature. I still remember the first digital cameras and how HUGE and bulky they were. Now a camera can comfortably nestle on your palm. But some people still wish that cameras will get more compact and more handy to bring. If you’re one of these people then you should eye the Pentax Q. 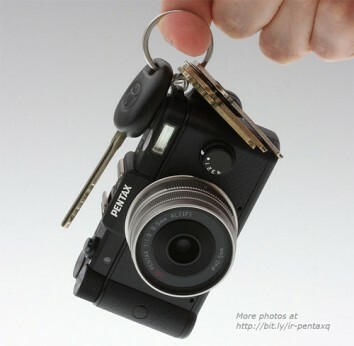 This new camera from Pentax could probably be the smallest camera that will enter the crowded digital camera market. But what would probably make it stand out from the competition is the fact that this is a very small camera that will allow you to change lenses. The Pentax Q is sturdily built with a magnesium alloy body. As for its innards, it will have 1/2.3” sized sensor capable of taking 12.4 megapixel images. It will also have a surprisingly large 3 inch LCD display with a viewing angle of almost 170 degrees. The flash mounting is innovatively made as it pops out of the body. This is a great design decision. By allowing the flash to move away from the lens, red eye anomalies are prevented. It also means that there is more room for mounting lenses with a large hood. Of course, the real meat of this camera is the ability to change lenses. Pentax said that it will be releasing five lenses with the Q-mount. Among these will be 35mm, f1/9 lens, which will be the kit lens. A zoom lens (f/2.8 to f/4.5), a fish eye lens with a field of view of 160 degrees, and finally two lenses that will produce optical anomalies – things that you usually associate with the Lomo. All of this miniaturization will come at a price though. Expect to shell out $800 for the Pentax Q.